The NATO Approved Carinthia Defence 4 is the most popular and best selling all-round sleeping bag with excellent weight to stuff size and performance ratio. 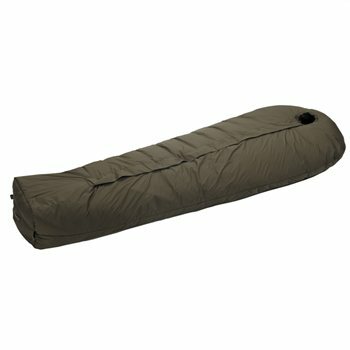 It is well established, 3 season sleeping bag that has proven to be 100% reliable on cold nights both inn the wilderness and in snow caves. A protection flap on the outside of the zipper keeps out wind and wetness.The outer shell is a super-light, highly resistant, microfibre nylon with a fine micro-porous coating which makes it waterproof. There is a generous draft tube on the inside of the zipper to prevent heat loss. Please note: this is a special order item and delivery time is 7-14 days. Delivery cannot be expedited by choosing express services. Manufactured from high-quality bi-component polymers, the structure of G·LOFT insulation is in fact similar in many ways to high-quality goose down. The 3-dimensional crimping ensures maximum resilience and loft. insulation outward, avoiding cold spots. There is also enough room to store a shoe bag or extra clothing. advantage is, however, that from the knee downwards there is increasingly less internal volume to keep warm. The foot section should not be so small that the feet cause the layers of insulation to poke out. A trapezoidal foot section has proven to be ideal. A wedge shape, declining evenly in width from top to bottom, does not fit the true proportions of the body. necessary (in case of alert for example). The glider on the down side does stick and can be opened for ventilation.